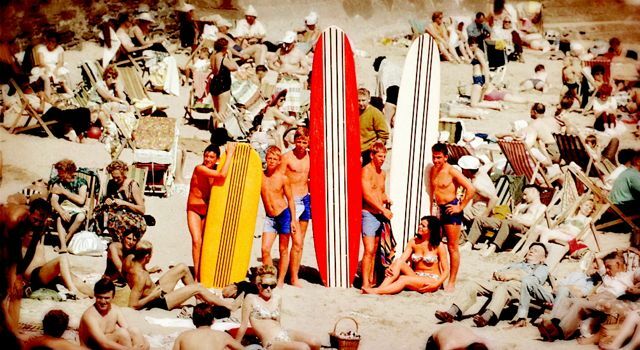 Mark Harris and Mitch Corbett are two surfers on a mission; to discover how Californian cool arrived on Britain’s bracing beaches, and grew from splashy summer fun, to a serious obsession with waves. They’ll visit the most iconic surf spots around Britain’s 5000 miles of rugged coastline; unraveling how the men and women of their native waters have evolved one of the most unusual and colourful surf scenes on the planet. Matt and James aren’t surfers but they like to think that they’re pretty decent filmmakers. The Endless Winter was written by Matt and James in 2009. They were making a promotional film about Mitch Corbett at the time and were surprised to find that there is very little information about where and why people surf in the UK and how it all began. They started reading and watching anything and everything and soon found what they describe as a treasure trove of characters, stories and waves. In summer 2009 they made a short film about the roots of the British surf scene and this became the trailer for The Endless Winter. The film was well received by the British surf scene and so their next challenge was to turn their idea into a feature length film. After 2 long years of research, writing and funding applications, production began. An 8 man crew of film-makers and surfers spent the winter of 2011/12 travelling the length and breadth of the country filming, surfing and trawling through hours of archive footage. They interviewed over 40 key characters in British surfing, surfed every great (known) wave in the UK and travelled some serious miles. By summer 2012 their 100+ hours of footage had been cut down to a 90 minute documentary about the brilliantly eccentric and truly unique British surf scene. “For us the aim of the Endless Winter was to share these stories and personalities and to give credit to the charming, hardy and ocassionaly mad characters that have created the British surf scene. Above all this film is for the British surfers and ultimately it was made by them. We’ve had so much help and support over the 3 years of production – support from writers, historians, filmmakers and countless surfers of all ages. We hope we’ve done them proud and in some way and captured what it means to be a British surfer.” – Matt Crocker, Co-Director, The Endless Winter.